An all-in-one wireless IR extension kit, perfect for all basic remote control extension requirements with a huge 50m range! Whether you have a dedicated AV rack in a purpose built cupboard or just want to hide some of your less nice looking gear in your TV cabinet (Looking at you VCR), this plug and play wireless IR blaster kit is the perfect solution. 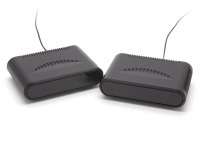 The transmitter and receiver communicate wirelessly at ranges of up to 50m so there's no need for painful cable runs through walls and ceiling. You can simply point the receiver unit at the device you want to control, or, if there's not much room or you have multiple devices, you can use the included three way extension cable. The kit includes everything you need to get set up and running including the transmitter and receiver, power supplies and 3-way IR beamer cable. It's designed to work with nearly every IR controller imaginable including Foxtel iQ2 and iQ3 which are notorious for not working with extenders. Simply place the tranmitter unit somewhere where it can see the signal from your remote controllers and turn it on. Place the receiver unit in front of the device you want to control and turn it on, now your done! Alternatively, if the device you want to control is in a difficult place to reach or you have multiple devices, just plug in the included 3m 3-way extension cable. Answer: "No, this AV Switch is not remote controlled." Answer: "It comes with a free 1.5m S-VHS cable valued at $9.95." Answer: "Yes, both outputs are running at the same time." Answer: "No, the two outputs run at the same time as a splitter so both outputs will be showing the same thing."